When I think back to my childhood there are certain toys that are ingrained in mind. For example my Fisher Price A La Carte Kitchen and then there is my Barbie Camper Van – oh how I loved playing with that camper van, from pretending ti take Barbie on holiday to leaving the trailer behind, folding out the back seats and going for a drive with Barbie and her friends. The amazing Barbie Glam Camper is built for glamping, this distinct RV holds more than meets the eye. From the outside, it promises sensational style and aaah-mazing adventure. When it’s time to stop for the night, disconnect the cab and open the camper to reveal multiple play spaces with all the comforts of home, plus a few fabulous extras. The Barbie Glam Camper has several areas in which you can play, the living room turns into the bedroom by pulling down the bed, a kitchen, barbecue area, bathroom and even a swimming pool that fits into the back of the cab once it is removed from the camper. This has to be one review item that I didn’t want to share with Roo – I was quite happy to relive my childhood years with the updated Barbie Glam Camper. Alas I’m not that mean so of course handed it over to Roo (with the promise that I could play with it any time I wanted). Anyway, the Barbie Glam Camper is quite a large playset and really allows you to interact and role play with it. Whilst there are no dolls included with the Glam Camper you are unlikely to be buying unless you already have a Barbie or two to enjoy the playset. With lots of accessories included you simply need to add some stickers (included), unpack the items and you are ready to have lots of camping (or should I say glamping) adventures. Roo really loved all the different features on the Barbie Glam Camper, especially being able to detach the car from the camper allowing to set up camp and then drive to see her Tawny horse for a spot of horse riding. The pull down bunks above Barbie’s bed allowed Roo to host sleepovers for Barbie’s friends and enjoy a barbecue toasting ‘smores. Available from Amazon, Argos and all other good toy retailers with a £94.99 RRP, although currently on offer for around £65.00 which is a fabulous price for this interactive Barbie Glam Camper. 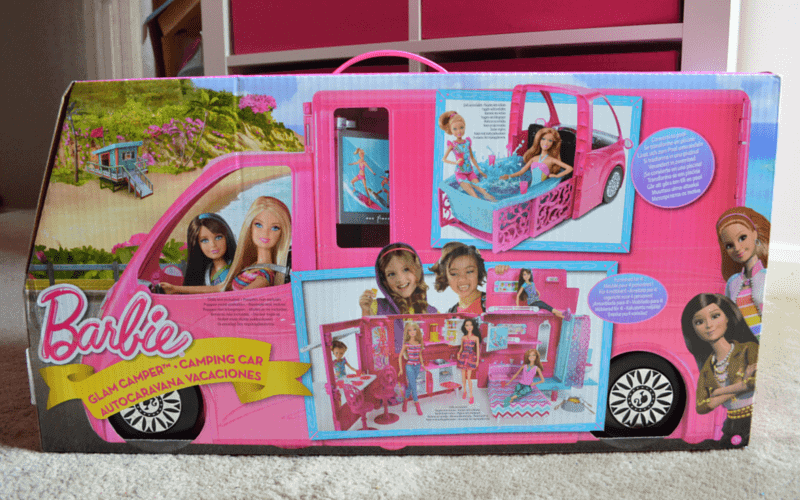 Disclosure: We received a Barbie Glam Camper FOC for the purpose of review. That looks fab! Something my girls would love. There is so much detail!